The Many Mini-Adventures of the Wards: Are we having fun yet? Any guesses where we are this week?? (she has a major crush on Jack Skelyton) and I got so frustrated we had to go home after one ride. It was so packed. I wonder if we were both there? Hmm. Well have fun and work those fast passes. If we hadn't left for Vegas I would have you guys stop by our house. Next time. Eat a churro for me. I didn't mean crazy. Sorry. DL is ALWAYS fun. You are brave. To face the Thanksgiving crowds. But here is what you are going to next year. You are going to miss a few days of school Monday amd Tuesday (what!? really?) oh yeah, maybe in like January or Feb and you are going to come stay at the Demke's (whopee!) 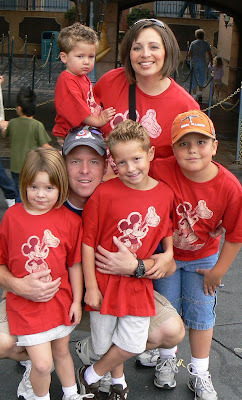 and we are going to go to Disneyland and walk on all the rides and rule the park! And you will get to see your old friends and hang out! FUN!! DO it! Do it!